From 21st to 22nd October 2018 the First Asian and European IAWM Women’s Museums Conference took place in Istanbul. 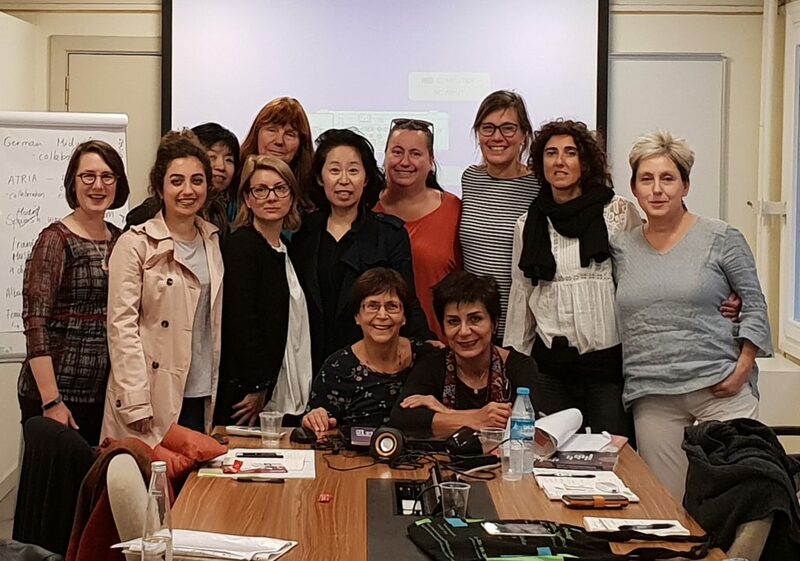 Women’s museum founders and researchers from Turkey, Iran, South Korea, Japan, Italy, Germany, Austria, Norway, USA, Spain, Argentina, United Kingdom, and Albania took part in the meeting. The goal of this meeting was to enable exchange and synergies amongst Asian and European women’s museums. Therefore the day started off with every participant presenting the status quo, the troubles, and future plans of their own museum, organization or initiative. 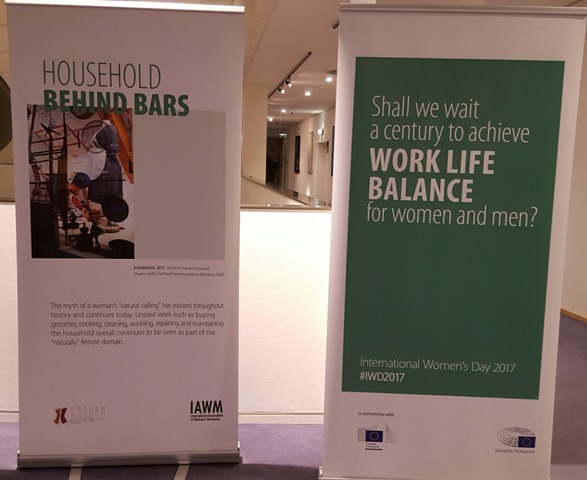 On International Women’s Day 2017 we had the chance to present IAWM through an exhibition at the European Parliament. IAWM has been invited to embed this two-day-event culturally. Images of artifacts and artworks emphasized the themes of the workshops: women and technology, violence against women, work-life-balance, gender-sensitivity in different countries, and the attainment of UN development goals. 12 members of IAWM from 11 countries in America, Africa, Asia and Europe contributed in the exhibition. Leaflets with further information in four languages (English, German, French, Spanish) accompanied the exhibition and can be downloaded here: Folder IAWM Work 17×23-printfile. 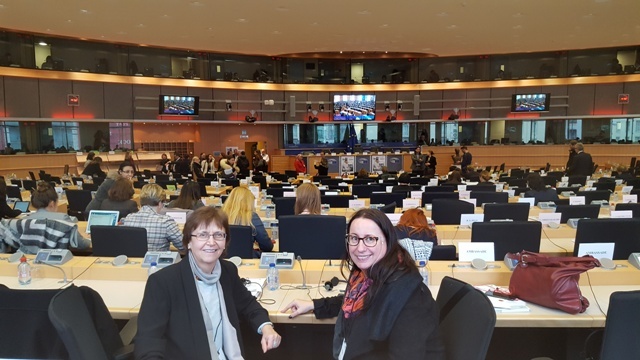 The director of the women’s museum Merano Sissi Prader accompanied the coordinator of IAWM, Astrid Schönweger, to Brussels. During the event Schönweger presented the activities and significance of IAWM and the women’s museums worldwide. From 20th to 24th March part of the exhibition travelled to New York. 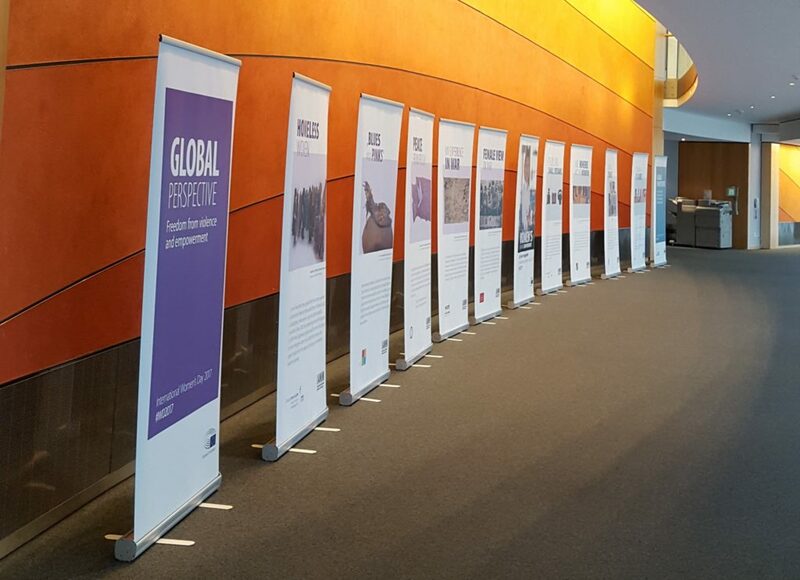 It was installed at the European Parliament side event of the 61st UN Commission on the Status of Women. The two-day conference was a meeting point for women’s museums from Italy, Austria, Switzerland, and Germany. The goal was to enable exchange between women’s museums and experts from related fields. 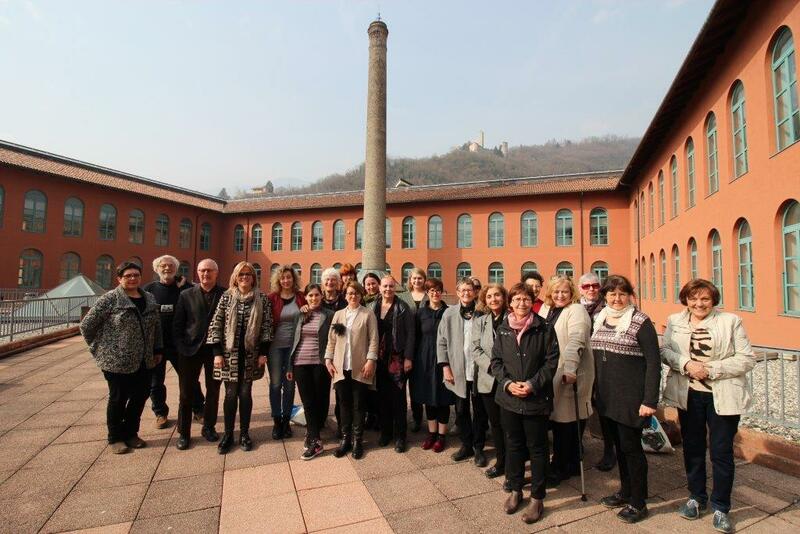 The conference was organized by the women’s museum Borgo and the association “La Casa di Alice” in collaboration with IAWM, the women’s museum Merano, and “Se non ora quando – Es ist Zeit Alto Adige/Südtirol”. 22 experts with various backgrounds, from museum professionals to experts from the gender and female world, delivered insightful talks about equality and women’s museums. In the evening the godmother of the conference, Maria Concetta Mattei, and others discussed the role of women in the media. On the second day of the congress Astrid Schönweger and Nadia Mazzardis conducted a workshop for women’s museums with the goal to enable exchange and inspiration. Representatives from Italian women’s museums and initiatives as well as the neighbors from Switzerland, Germany, and Austria came to the conference. The 5. International Conference of Women’s Museums with the title “Women’s Museums: For a Culture of Equality” took place from 28 until 30 November 2016. The International Association of Women’s Museums, with its office in the women’s museum Meran/o (I), met for three days in Mexico City. Host of the conference was the women’s museum Mexico, which is led by FEMU (Federacion Mexicana de Universitarias AC) and the University of Mexico City. In the dignified hall of the old Faculty of Medicine, University of Mexico City, the congress was inaugurated by Patricia Galeana, the director of the women’s museum Mexico, the godmother of the congress Patricia Mercado, Secretary of Government Mexico City, and Monica Gonzalez Contro, advocate of the university on behalf of the rector. Highlight of the inauguration was the award of the first IAWM-prize to the Senegalese director Annette Mbaye D’Erneville. The 90 year old Annette Mbaye d’Erneville has not only founded the first African women’s museum in Senegal, but also inspired others to do the same. Mali and Central Africa followed her example. The Canadian women’s museum was founded by her niece Lydie Olga Ntap. „Tata-Annette“(aunt) or „Mere-bi“(mother), as she is called, shows us how one single woman is able to change the world. As first female journalist in Senegal she advocated throughout her life emancipation of women and democracy in her country. The statue was created by the Mexican artist and women’s museum woman Glenda Hecksher and the monetary prize of 5000 Euro was donated by the Soroptimist Clubs Vaduz (LI), Zug (CH), Goldes (A), and Meran (I). After the celebratory opening of the congress the hosts provided a guided tour in the women’s museum, where the rest of the congress took place. Representatives of international women’s museums and women from the University of Mexico City spoke about the significance of women in history, promotion of human rights through women’s museums, socio-political and socio-cultural work of women’s museums in society, and their commitment against gender-violence. In a workshop various women’s museums presented and discussed best practices and creative solution finding. Throughout the congress it turned out that many women’s museums worldwide are facing similar problems at the moment. Some do not have the necessary financial means, some face a misogynistic society and some have to justify their existence over and over again. Fact is that hardly any cultural institution has to put up with so many adversities and obstacles as women’s museums do. Letters of support for the momentarily affected women’s museums were written during the congress. The indigenous sociologist Silvia Monzon from Guatemala, who has founded an initiative for a women’s museum, wrote a statement which was signed by all participating museums and will be published on the website and social media of IAWM as soon as possible. On the last day the general assembly of IAWM took place, where the statutes were modified and the program of the next four years was determined. Also the elections of the new board took place: president of the association remains Mona Holm from Norway. Vice-president is from now on Lydie Olga Ntap (CAN). Other board members are Kye-Hyeong Ki (Korea), Gaby Franger-Huhle (D), Catherine King (USA), Elsa Ballauri (Albania), and Claudia Mandel (Costa Rica). Sissi Prader (I) is co-opted as treasurer. The congress takes place every four years. Last time IAWM met in Alice Springs (Australia) in 2012. The 6th International Congress of Women’s Museums of IAWM will be 2020 at the women’s museums Hittisau (Austria). 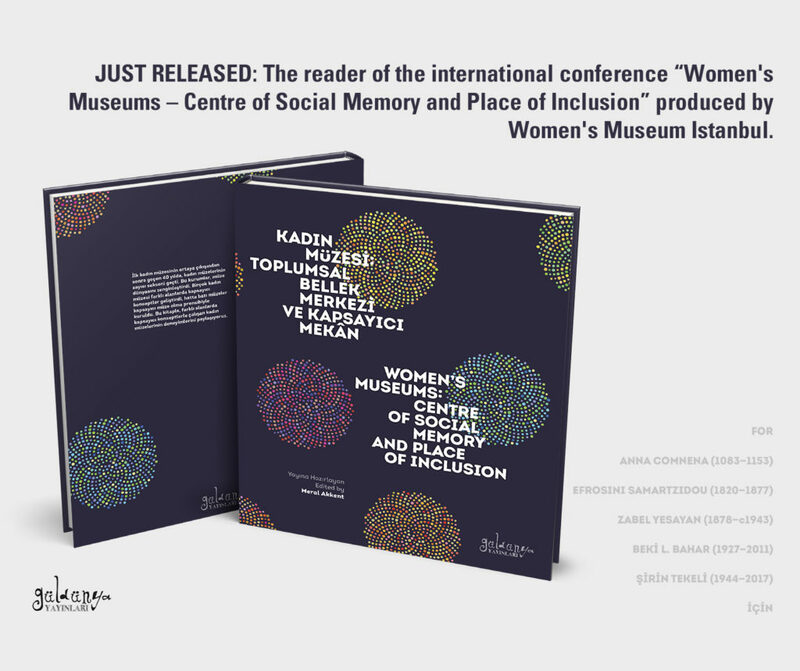 In Oktober 2016 the women’s museum Istanbul organized the conference “Women’s Museums: Centre Of Social Memory And Place of Inclusion”. Experts and museum professionals from Turkey and many other countries met in Istanbul in order to talk about women’s museums and their role in society. 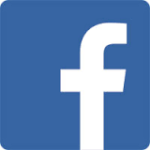 Please find here the pdf document with the program. Costs: 20.- EURO shipping included. 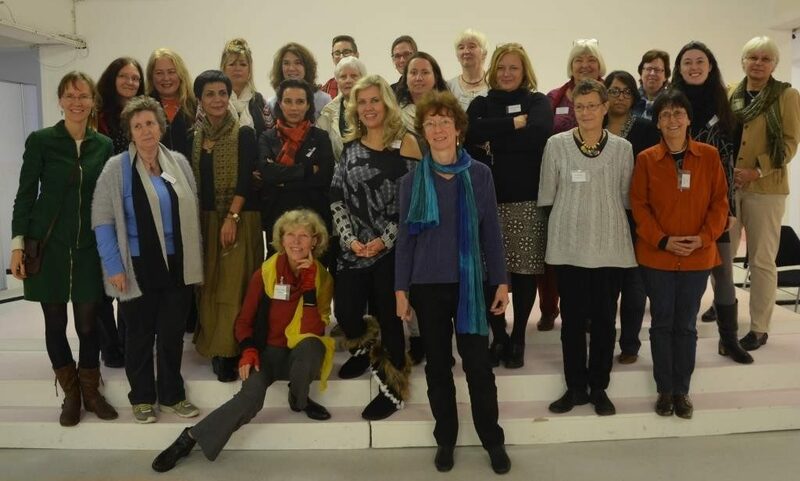 25 members of 14 countries in Europe, Asia, Latin America and Africa took part in a conference on November 6 and 7, 2014, at the Frauenmuseum Bonn to work on new strategies and projects. All of them are members of IAWM.